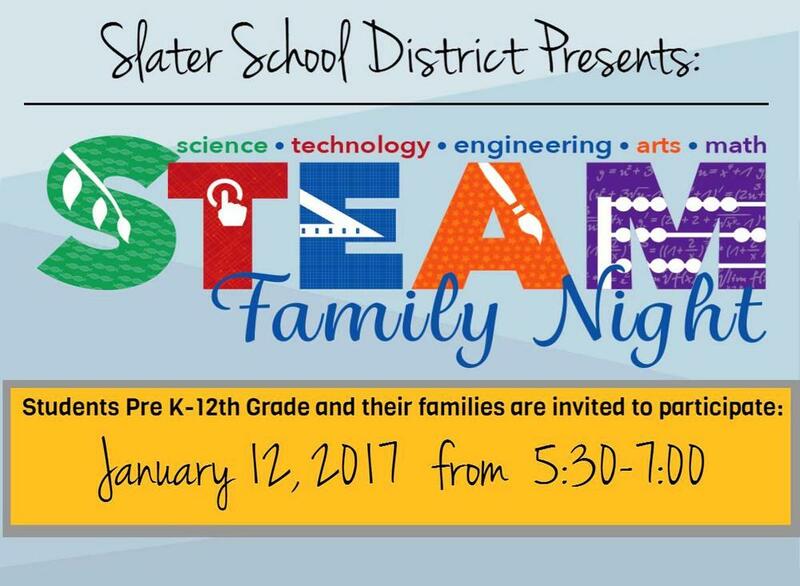 The Slater School District invites all students and their families to join us as we go FULL STEAM AHEAD and explore the fields of Science, Technology, Engineering, Arts, and Math. Join us for fun, hands on activities which include building, arts and crafts, food science, and more! Students who attend will be placed in a drawing for a $50 Wal-Mart gift card. FULL STEAM AHEAD will take place from 5:30 pm to 7:00 pm on Thursday, January 12. Registration will take place in the Superintendent/Library foyer. Students in PreK-5th grades need to be accompanied by an adult.